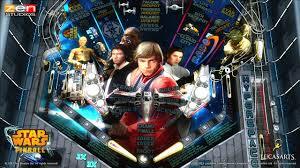 Is Zen Pinball's Star Wars Pinball a deep-space treasure trove or is it an intergalactic dirt clod? Find out by reading our review! 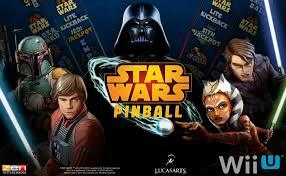 The gameplay in Star Wars Pinball is very realistic and features true-to-life physics and great secrets to find in every pinball table. 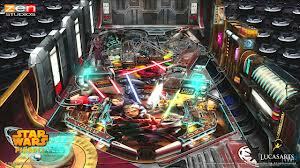 The game currently features 3 pinball tables including Star Wars The Clone Wars table which is based on the popular Cartoon Network adaptation of the Clone Wars saga, but 3 more tables are coming soon in a future update/dlc! When you first setup your profile you get to choose which side you want to be allied with. The better your position on the leaderboard the more you contribute to your side! The colors of the main menu display the tug of war between the light side "Light Blue" and the dark side "Crimson Red" and change as players post their scores to the leaderboards! You may also switch sides from the options menu at any time. The controls in the game are very easy to learn and are also very responsive which is something Zen Studios has improved since the release of the original Zen Pinball on other consoles. The game can only be played with the gamepad which does feel a little awkward due to the controller's size, but the sound and picture quality is amazing during off-TV play sessions! The graphics of Star Wars Pinball are nothing short of breathtaking, the video display screen, bumpers, flippers, and everything else on the tables look so real you'd swear you were actually looking at a real pinball table! 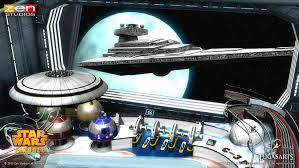 The narrator of the Star Wars series lends his voice to the game, while the music and sound effects are simply amazing! With flawless gameplay, smooth and responsive controls, and breathtaking audio and visuals, Star Wars Pinball is a game that truly brings the force to the Wii U and we highly recommend the title to both Star Wars fans and fans of pinball games! Fixed a few errors in the review. Your tagline is brilliant lol. Could be worth checking out. Thanks for reviewing this title. Is this better than Zen Pinball 2? Beautiful review Rukiafan the game sounds really fun! Good game and good review.